The University of Bradford’s School of Health Studies has recently completed a move from its old Trinity Road campus to the university’s city campus. The new school, providing a gateway into the city campus, includes a refurbishment of the existing Horton A building, as well as a purpose-built extension. The project represents a significant investment in the sustainability and development of healthcare in both Bradford and its surrounding region. New facilities include modern clinical skills rooms, a movement laboratory and PACS (digital imaging) suite, as well as dedicated staff and student areas. The aim of the University Estates Department and the architect was to create a truly sustainable building and make the School of Health of one of the greenest in the country. The building has been built and designed using the university’s sustainability specification, which has particular focus on building physic, thermal mass, high levels of air-tightness and insulation and passive systems, rather than the traditional mechanical systems. ISG won the contract to build the new four-storey extension to the existing Horton A building. Designed by architect Farrell & Clark, it enhances the university’s reputation in sustainable construction and underwrites its Ecoversity sustainable development programme. For the external façade, many different products were considered but due to the complex shapes and shades required, and the inherent benefits of the material, Grade 18 GRC emerged as the preferred choice. 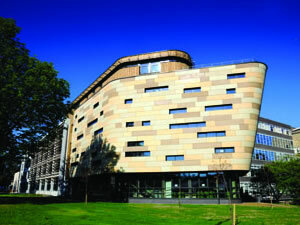 GRC panels reduce the weight and thickness of	concrete cladding by up to ten times. Glass-fibre concrete is a high-performance, mouldable, highly durable composite product, with a typical weight of 70kg/m2. The building life and durability of GRC issignificantly enhanced as a consequence of the product resistance to corrosion, UV light, fire and variations in temperature. Panels are recyclable and it is a BREEAM A+ rated product. Russell Smith, the university’s estate manager, says, “It is extremely important to use materials that have green credentials, as it allows the university to build in a sustainable manner". The project architect recognised very early on that expert input was paramount to the project’s success and so enlisted the services of GB Architectural Cladding Products (GBA). The GB Group is a privately owned business with over 20 years’ experience in natural stone, facing brick distribution, precast concrete and GRC manufacture. Throughout the past ten years the group has dedicated its energies toward the production of lightweight fast-track building solutions, particularly Grade 18 engineered GRC cladding. It operates from 3700m2 of production space in Liversedge, west Yorkshire. Once the large-scale mock-up samples had been approved by the local planners the next project milestone was to develop and agree the detailed layout and configuration of the GRC panels and also the means by which they could be attached to the background substrate (an in-situ concrete shear wall). In addition, all related insulation, deflection and thermal movement considerations had to be factored in. GBA engaged the services of industry design consultant Smart Crosby International (SCIL) to advise its in-house technical team. The geometrical complexity of the GRC façade with varying lengths, radii and the vertically inclined surfaces of elements required a 3D analysis in order to identify the fit of each element to accommodate the constructional and installation tolerances, and the line and level of each GRC panel along the line of sight. The panels’ design and fixings methodology also had to permit reasonable installation tolerances together with rapid, efficient installation. These setting-out factors, together with a requirement for a large insulated cavity (which provided a further design challenge for the cantilevered fixing arrangements), were all painstakingly fulfilled by the team at SCIL, in conjunction with GBA, architect Farrell & Clarke and structural engineer WSP. Following the preparation of approximately 400 layout, component, restraint drawings, together with all the relevant structural calculations, the designs were signed off in October 2010. From this point, GB Architectural Cladding Products created its master production moulds. This complex and absolutely critical process demanded eight weeks of devotion from highly skilled pattern makers, under close ‘in-house’ supervision and also the ever-watchful eye of ISG’s senior site manager Ian Armitage. The actual casting, finishing and quality assurance processes began on 1 February 2011 and continued through to the end of March. The first delivery of panels to the site storage compound took place during the first week of April. The installation process negated the need for site cranage and external scaffolding. It was totally unaffected by inclement weather and, in the main, was completely removed from the project critical path. The design methodology followed tried and tested principles, which facilitated fast, simple, effective connection details. This avoided the need for any secondary carrier system. Swift, seamless GRC façade installation ensued, all completed in just over six weeks. Any routine maintenance requirement once installed is virtually non-existent. Much to the delight of all concerned the contract was executed precisely on time and budget. The result is a striking, totally unique GRC façade, which will prove to be of interest and inspiration to many for years to come.